This recipe has been bookmarked in my Pastry Queen cookbook for a couple years at least. The photo of these always makes me pause and swoon a little whenever I’m flipping through the pages. You’ll have to buy the cookbook to see it. My photo doesn’t come close. I find it hard to resist the sweet, bready, ciannamony, yeasty goodness of a cinnamon roll. My favorite rolls are at The Upper Crust Bakery in Austin, Texas. They’re a totally different type of cinnamon roll with a crunchy cinnamon sugar coating instead of a gooey frosting. If you’re ever in Austin, you must go get one. The problem with me and cinnamon rolls is the commitment (and the mess). Make the dough, let it rise, make the filling, roll and fill, cut and place in the pans, rise again, bake, frost or glaze, then enjoy…if you even have the energy at that point. And if you want to make these fresh for breakfast you have to either get up at a ridiculous hour or use some time management skills to get them ready for a morning rise and baking. So much work! But these are well worth the effort. You can even freeze them for later, which does require some work on the front end, but you get yummy cinnamon rolls straight from the oven without having to touch a bit of flour. For some reason (could have been the 2 lonely potatoes on the counter) I just felt compelled to commit to these last week and am so very glad I did. I baked 2 pans of these rolls and there are 3 more in my freezer that are a mere overnight thaw and hour rise away from being enjoyed. Yes, this recipe makes 5 pans of cinnamon rolls. So make sure you either need to feed a hungry army, give these away as gifts or have room in your freezer and save them for later. Oh, and make sure you have 2 good sized bowls for rising. The recipe says to let the dough rise in one bowl and then divide it in half. Well, I do not have a bowl big enough for that and I don’t know who does…except for maybe my mother-in-law. So I divided the dough in half before rising and still had to use 2 of my biggest bowls. 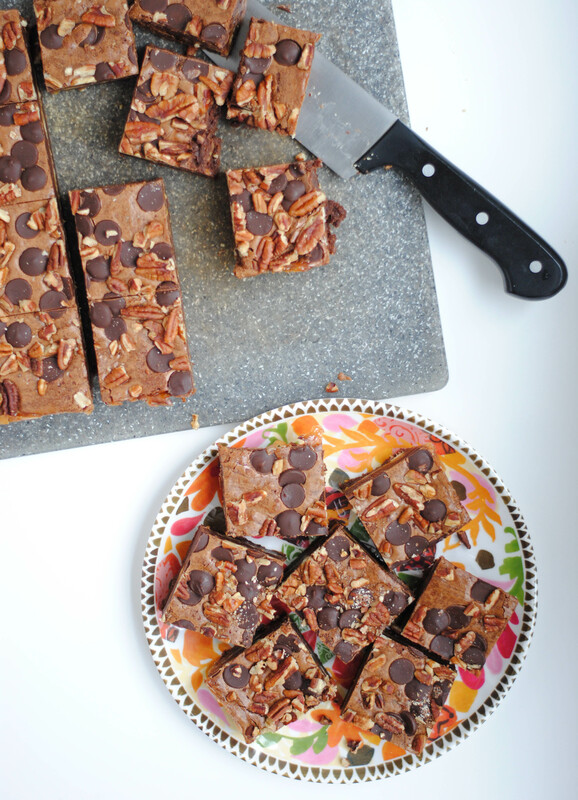 The pecans are optional. I made one half of the rolls with and the other half without. If I’d really been thinking I would have baked one pan of the with and one pan of the without, but I wasn’t thinking. So all of my rolls with pecans are in the freezer. 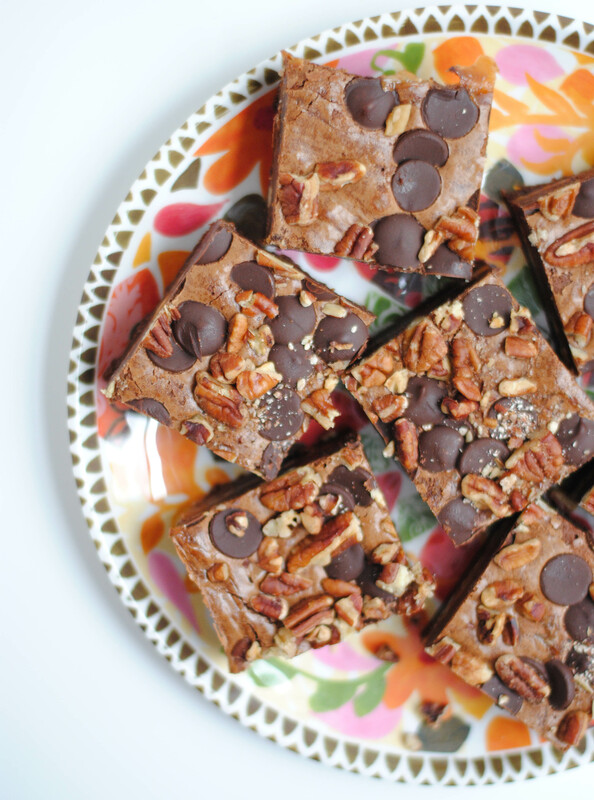 I am sure they’ll be delicious since most baked goods are better with pecans. Using mashed potato in these rolls gives them a lighter texture than your normal roll. They don’t taste like potato. They are just slightly sweet, unless you drench them in frosting (like I do). If you bake and don’t eat all the rolls in the same day, cover and refrigerate the rolls. Warm in the microwave for 10-15 seconds to recreate the fresh-from-the-oven flavor. Store for 3-4 days at most in the fridge. They’re just not as good after that. Grease two 9X13 disposable foil pans (you will probably need more pans, depending on how many rolls you end up with. I used 5). Wash, peel and quarter the potatoes and boil until fork tender, 10-15 minutes. After boiling the potatoes, set aside 3 cups of the potato water and let cool to 110 degrees using a candy thermometer, or to the temp of hot water coming out of the faucet. Mash potatoes in a large bowl, set aside. Sprinkle yeast over the water, stir until dissolved, add 1 tsp. sugar. Allow to rest for 5 minutes until foamy. Whisk the mashed potatoes and 3/4 cup sugar together. Add the melted butter, eggs , salt and potato water and mix until smooth. Switch to a wooden spoon, and add the flour 3 cups at a time, mixing until combined. Mix until all the flour is incorporated. Place the dough in 2 large greased bowls. Cover with a damp cloth and leave in a warm place until the dough is doubled in size, about 1 to 1 1/2 hours. With floured hands, remove one batch of the dough from the bowl onto a well floured surface. Using a rolling pin, roll into a 1/4 inch thick rectangle. About 20 X 10. Spread the rectangle with half the butter, then half the brown sugar mix, then half the chopped pecans. Starting with the long side, carefully roll the dough. Using a very sharp floured serrated knife, cut each roll crosswise in 2 to 3 inch slices. Place the slices, cut side down, in the foil pans spacing about one inch apart so they have room to expand. Make sure the end flap of each roll is set snugly against a side of the pan. Repeat with the other bowl of dough. At this point the rolls can be tightly wrapped in plastic wrap and a layer of foil and frozen up to 3 weeks. Defrost in the refrigerator overnight or for one hour at room temperature and continue following the directions from this point. Leaving them covered, set the rolls in a warm draft free place and let them rise until they get puffy, about 1 hour. Preheat oven to 375°F. Remove covering and bake the rolls for 20 to 25 minutes or until light brown. 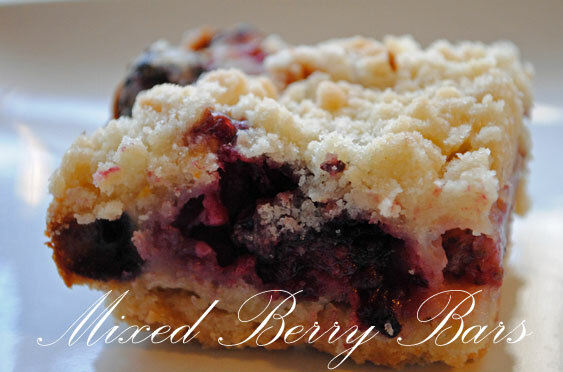 Recently I made these blackberry pie bars again. The recipe is from Rebecca Rather’s cookbook The Pastry Queen. Buy it. This time around I found the bottom crust to be a little on the thick side, and there was an awful lot of filling. These bars are so substantial that they are best eaten from a plate with a fork. These are one of the best things you will ever put in your mouth. Ever. They are just really decadent and I thought it would be nice to have the same flavors, but in a bar that was a little easier to eat. So, with some extra berries I decided to make the bars again with a thinner crust, and less filling. Since I only had a small bag of frozen blackberries I used a combination of blackberries, blueberries and strawberries. A total of 4 cups of any berries would do. As with the Pastry Queen’s recipe, thaw and drain any frozen berries that you’re using. I found these bars to be much easier to just pick up and eat. There are tons of things you could do with these. Use different combinations of berries, maybe use peaches, add some ground pecans, almonds or walnuts to the crust and/or crumb topping or even play with spices…cinnamon, nutmeg, cardomom. Oh, the sweet and delicious possibilities! I might try a small batch in an 8×8 pan so that I can try more of these variations without having too many extra goodies around the house. I find these to be extra special served with a small (or maybe a rather large) scoop of Bluebell Homemade Vanilla ice cream. Enjoy! Combine the flour,sugar and salt in a food processor fitted with the metal blade. Process until fully combined. Add the butter to the flour mixture and process until the butter is evenly distributed,but the mixture is still crumbly. Reserve 1 cup of the crumb mixture for the topping. Press the remaining crumbs into the bottom of the prepared pan. Bake the crust for 12-15 minutes,or until it is golden brown. Cool for at least 10 minutes. Add the sour cream, flour and salt. Gently fold in the berries. Spoon the mixture evenly over the crust. Sprinkle the reserved crumbs evenly over the top. Bake 50 minutes to 1 hour,or until the crust is lightly browned. Cool for at least 1 hour before cutting. One of my favorite cookbooks is The Pastry Queen by Rebecca Rather. I won’t say any more about it except for this: If you don’t own a copy, as I have said before, go buy one…now! I made these quick and easy oatmeal cookie bars this past weekend when our small group from church came over. 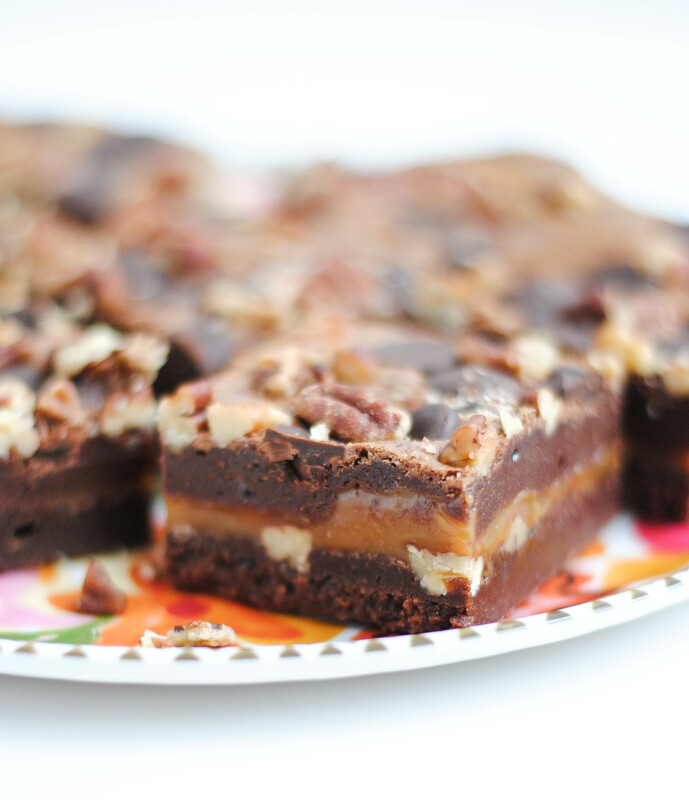 Originally I was going to make brownies from a mix since that would not require too much in the ways of time or effort on my part. I just did not feel like spending any more time than I had to in the kitchen that day. When I came across this recipe and realized how simple they would be, I had no choice but to make them. Homemade is always better than a box. The ingredients and preparation for these crispy oatmeal bars are both incredibly simple and easy. You probably have everything you need in your kitchen. The prep could be done with your eyes closed. They bake for a measly 20 minutes and are ready to enjoy or drizzle with chocolate soon after making their exit from the oven. Easy and delicious. It doesn’t get much better than that. I melted my chocolate chips in the microwave in a Pyrex measuring cup. Zap the chips on high for 30 second intervals, stirring in between until the chips are smooth. I didn’t do the best job of drizzling. A few spots were more globbed on than drizzled. Another good idea is to chill these after drizzling the chocolate to let them harden up a bit before removing them from the pan and plating them. 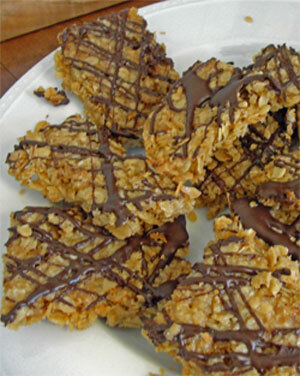 A few of my crispy oatmeal treats broke when I took them out, which is a blessing in disguise because that means more for me! These treats are a simple and humble cookie, and they are definitely worth the time and energy it takes to make them. Melt butter, brown sugar and corn syrup in a saucepan set over medium heat. Stir 1 to 2 minutes, until brown sugar dissolves. Remove the pan from the heat and stir in vanilla. In a medium bowl stir together oats, baking powder, salt and coconut. Add butter mixture and stir to combine. Spoon the batter into the pan and with fingers coated in cooking spray, press the batter evenly into the pan. Bake for 20-25 minutes. Cool for 20 minutes and cut into bars. 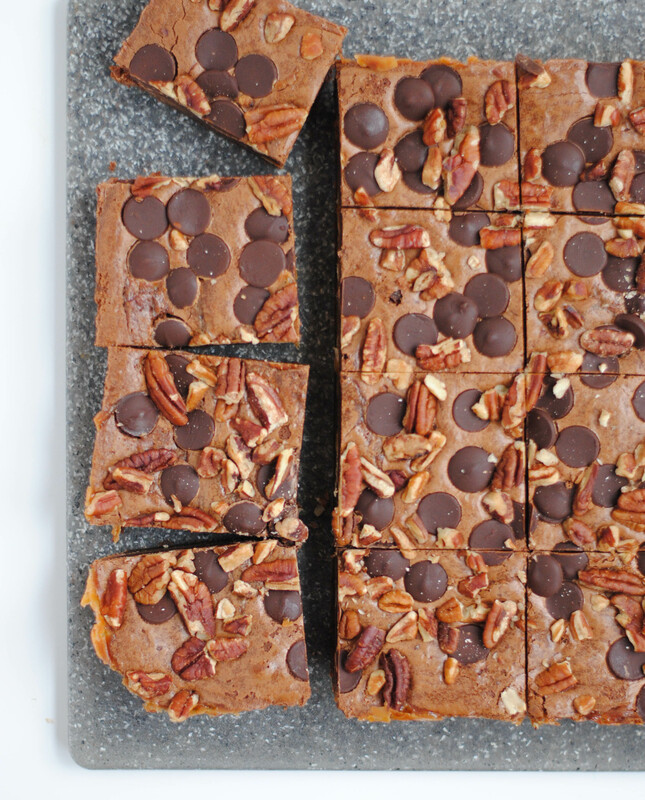 Melt the chocolate chips and drizzle over the bars. Chill in the fridge for a few minutes to let the chocolate harden.